The phenomenal rise of Indian Premier League had given the impression of India being the happy hunting ground for professional sports. The IPL while presenting to the cricket world a league model as the best source to generate revenues has also fuelled the commercial aspirations of other sporting associations and sportspreneurs in India. The leagues mushroomed up by the year after the unbelievable success of the IPL right from its inaugural season in 2008. Some sustained, few flourished and many diasappeared after an ambitious start. Star Sports-owned Pro Kabaddi League’s success has given the indigenous Indian sports a global recognition and base, Indian Badminton League with its launch in 2013 gave India a tool to emerge as the controlling power for the world badminton, Wrestling League’s success on television has been phenomenal. The year 2019 starts on a promising note for professional sports business with the launch of the Pro Volleyball League. However, the year gone by – 2018 – has seen the end of many a sports leagues, including the Hockey India League which was establishing new benchmarks for growth and success. InsideSport.co brings to its readers five professional sports leagues which collapsed in 2018. Hockey India League was launched with much fanfare in 2013 by Hockey India, the governing body for the sport in India. Undoubtedly, the HIL remained one of the most successfully organised and impactful leagues in the country for five successive seasons. The former Hockey India president, Dr Narendra Dhruv Batra, led the project from the front. His commitment to restore Indian hockey’s lost glory was second to none. His vision to secure hockey players’ future reflected in his endeavour to make the HIL an unprecedented success. As Dr Batra progressed to lead the world hockey body, the HIF, and the Indian Olympic Association, the bigger challenges and bigger goals meant the committed sports administrator won’t be able to focus on the Indian Hockey and the HIL as he would do as the Indian Hockey Federation president. Batra’s absence in Hockey India meant the league was “suspended” for 2018 in spite of a highly successful season in the previous year. Now, there are assurances of restarting the league this year, but there are no confirmed dates or plans. Premier Futsal in fact was an entry of an overseas sporting format in the commercial world of Indian sports. The multi-national Futsal league was conceptualised by Indian entrepreneurs under the Premier Futsal Management Pvt. 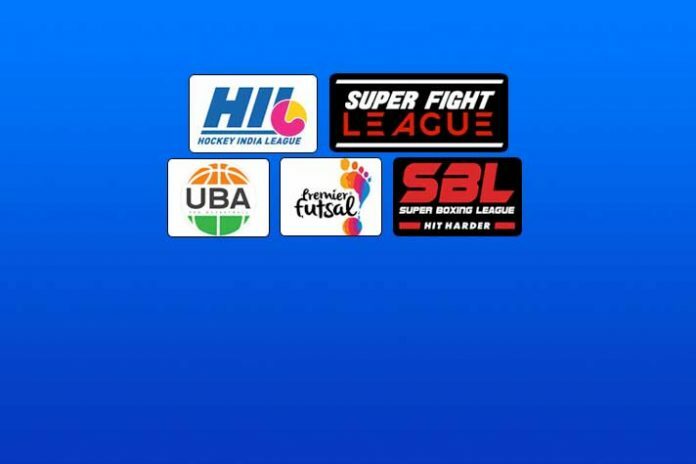 Ltd. Abhinandan Balasubramanian, Dinesh Raj and Nithyashree Subban, backed by business magnate Xavier Britto and his wife, philanthropist Vimala Britto founded the entity to establish Premier Futsal as a global league in India. The eight-team league announced its arrival with India’s biggest brand icon Virat Kohli as the face of brand Premier Futsal. The Franchisee-based league had its first edition in Chennai and Goa between July 15 and 24, 2017. The flashy launch was exhibiting the organisers financial might. The next season in 2018 had eight teams and a bigger hope for future. The league had a broadcast agreement with Sony Pictures Network. However, in a nation where country’s richest football league – ISL – and “official” football league – I League – are struggling for commercial success, Premier Futsal lost it steam in a mere two years. It did not take off in 2018. The first professional boxing league in India – Super Boxing League – was launched in 2017 with much fanfare and hype by British-Asian businessman Bill Dosanjh and British-Pakistani boxing champion Amir Khan. Eight teams in the inaugural year with considerably impressive men and women boxers in the ring augured well for a nation that has shown an appetite for quality combat sports. Success of physical sports professional leagues like the Pro Kabaddi League and the Indian Wrestling League held hope for the Boxing League as well. But the league in spite of quality competition was found wanting for the desired commercial success. Fears became realty and the Briton-Asians failed to show enough financial muscle to invest in the league for the second straight year to see the property through the proverbial gestation period. The Mixed Martial Art professional league – the Super Fight League – was among the few Indian professional leagues to run for five years. The league had backing of Indian film star Sanjay Dutt and British-Indian entrepreneur Raj Kundra, who has also had interest in the Indian Premier League team Rajasthan Royals before an unceremonious exit following the spot-fixing controversy which had also resulted in a two-year suspension of the team. The league claimed to have 67 live televised events, with over 100 million views. It would produce at least 50 live televised events broadcast across various sports and GEC channels in the country. The league also had its reality show Super Fight League Challengers. Its shows were spread across the geographical regions of India. But for its presence in India, it lacked a lot of Indian-ness. Above all the Indian icons who drive the fans to the competition arena and television screens and result in the desired push to a sporting property for making it a commercial success. After ambitious and full-of-hype five years, the Super Fight League failed to return in 2018. The future remains uncertain. The men’s maiden professional league in India – United Basketball Alliance (UBA) – was launched in 2015 and had two seasons in the very next year. The eight-team league was divided into two divisions – North and South – with four teams each. The division of the region primarily relied on the convenience of the organisers than the geographical boundaries of the country. While Mumbai was part of the North Region, Pune figured in South. Even though the UBA Pro Basketball Alliance was promoted as the first pro basketball league of India, there was little Indian representation the league management. But for a director Nadu Mehta, the other management – Tommy Fisher, CEO and Chairman; Todd Mack, Managing Director; Michael Yanke, CMO; AC Green, Director of Sport; Paul Crane, VP, Broadcasting; Stephen Graham, Executive Producer; Jody Basye, Director of Coaching; and Jon Kimberlin, League Assistant Coach – were all non-Indians. The UBA conducted four seasons – 2015, two in 2016 and 2017. But it made little impact to count for a pan-India reach or leave a strong impression on commercial partners. After four events in three years, the league did not take place last year and there is no word about its returning again. The Indian Premier League success creates a notion of India being a ready market professional sports. However, the other non-cricket sports need long term business plans and financial muscle to support them till the time the IP becomes a commercially successful model. Harish Bijoor, brand and business strategist and owner of Harish Bijoor Consults Inc, aptly sumps up the scenario: “Every sport in India is a subset of cricket. Therefore every league is a micro subset of IPL. It will take a while for all others to grab a hold in the market.” The business of leagues is expensive and few find steam sufficient to survive that “while to grab a hold in the market”.